Jeannine has been a passenger since she was very young. Finally! My daughter, Jeannine has submitted her first post. She has so much to contribute, being a longtime rider, recent MSF RiderCoach, track day control rider, industry professional, and of course my daughter. Let’s see what Jeannine has to say about those times when she finds herself on the back of a bike, instead of in control behind the handlebars. Being on the back stirs unique thoughts and feelings when you’re a rider yourself. Ever since I became a licensed motorcyclist, riding on the back has been a challenge because I’m not in control, eek! I also wonder what being on the back says about me as a rider to the general public. Although these are generally taken as negatives, I’ve learned that there are benefits to spending time as a passenger. Riding on the back of a motorcycle, especially as an educated rider, means giving up a lot of control. For starters every motorcyclist knows the risk of swinging a leg over, so what about accepting the risks when someone else is controlling the handlebars? When you get on the back, you better be willing to trust them to make decisions that will protect both of you. When you look at the helmet (hopefully) in front of you, can you say you trust them with your life? If not then get off. Especially as a rider, giving the control to someone else is the ultimate display of trust, something many people aren’t willing to do. It seems the more educated about riding you are, the more trust is required to get on the back. Ever see a girl jump on the back with some guy she just met? She probably has no real understanding of the consequences. There are only a handful of people I am willing to ride with and each has thoroughly proven their abilities, both through raw skill and the risk-evading decisions they consistently make. 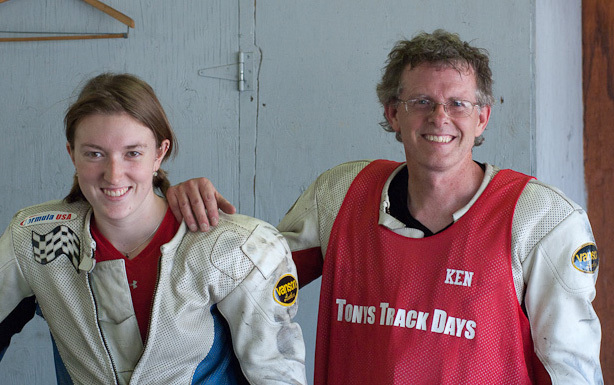 Ken follows Jeannine on the track early in her riding career. What does it say about me as a rider? The stereotype is that women and kids ride on the back. As a female rider, something tells me I don’t want to succumb to those expectations. If we pull up to a gas station and people see me on the back what will they think? It doesn’t likely cross their mind that I too am a competent rider. Imagine the look we get when passenger and rider switch! Even as a rider I am often mistaken for a guy and I DO enjoy proving them wrong. Just the other day someone told Dad “That’s a really nice bike your buddy has”, imagine his surprise when the response was “That’s actually my daughter”. Although I have learned to care less about the opinions of the public, it’s always an itch in the back of my mind. Is the passenger missing out? My short answer is no, you are simply experiencing the ride differently. Imagine all those phenomenal views that you can’t fully absorb while you’re also paying attention to the road. On the back you can actually look around without having to worry about the oncoming car or the upcoming hairpin turn. 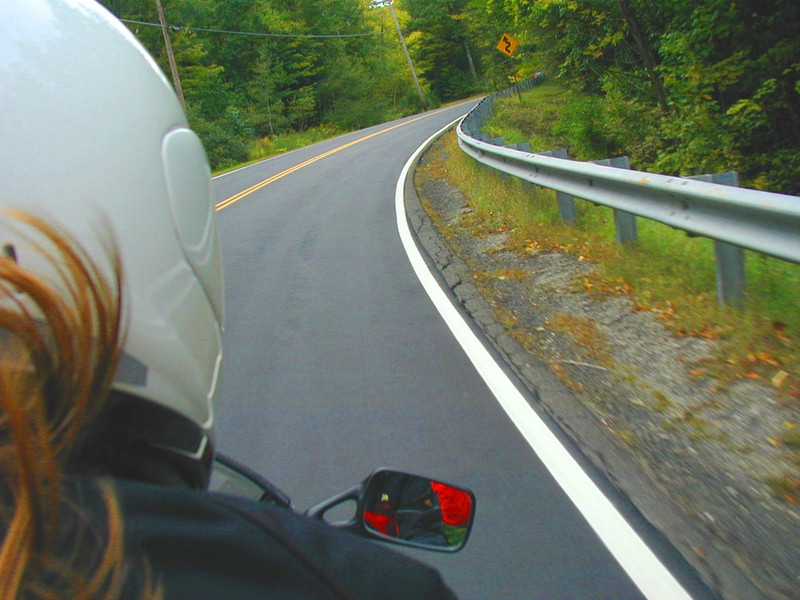 While sitting behind another rider, pay attention to how they handle traffic, negotiate curves and anticipate hazards. Use your time on the back to improve your own riding. It doesn’t mean you have to, or even should, handle a situation in the same way, but take advantage of the learning opportunity. Ask yourself if you would do something differently and then analyze why and how your strategy might turn out better. Have you been a passenger lately? How does it feel? Subscribe to my Newsletter Mailing List. I thought it might be fun to share a sampling of statements I hear often from Mr. and Mrs. Non-riding Public, along with my usual response. Perhaps these statements are familiar to you, too. And maybe your responses are similar to mine. Whatever. This is directed toward the fact that I’m wearing a jacket, riding pants, gloves, etc. This question often makes me scratch my head, because I assume that people understand the concept of wind chill factor and can imagine that the gear I have on is perfect, not only for comfort, but also for protection. Yeah, they don’t seem to understand that riding gear is a compromise. Even the best vented gear can be hot even at speed, but I won’t ride without protection. Grasping that concept seems a bit too difficult for Mr. and Ms. Public without some patient education. My response: “Not once I’m rolling over 30mph.” “Besides, I need the protection, just in case”. Loud pipes are the result of riders who want to be loud. This usually comes up in conversation at parties when I disclose that I am a motorcycle rider. I can fully understand the non-motorcyclists’ reaction to obnoxiously loud pipes. Even as a career rider, I am annoyed and barely tolerant of loud motorcycles. Imagine the lack of tolerance Mr. and Ms. Public has for riders who invade their peace and quiet. Stunned silence usually follows as they try to comprehend that someone would take a perfectly good (quiet) motorcycle and make it obnoxious…on purpose. I get it. A motorcycle that makes no sound seems to lack a visceral depth that most riders value. But, personally, I’ve come to value not invading others’ auditory space with my exhaust, so I keep my street bike exhausts stock. I recently rode an electric “Zero” motorcycle and I can tell you that the total lack of engine sound did not take away from the awesome performance and unique experience of this torquey, fun machine. I contend that excessive noise detracts from riding enjoyment, rather than enhances it. And then there is the “Loud Pipes Save Lives” theory. While I understand that loud pipes can get attention, making a bunch of racket is NOT a reliable way to get people to avoid you. Lane position and other strategies that allow you to be SEEN are much more effective ways to avoid a mishap. Besides, sound is directional, so exhausts pointed rearward are of little benefit when the most likely collision scenario involves an approaching vehicle turning left across your lane at an intersection. Yes, motorcycling exposes us to risk, which is why we wear protection. This question needs no explanation, except that people who ask are implying that because it is risky to ride a motorcycle, that I must be a person who exercises poor judgment. These are often people who value safety and therefore distance themselves from risk…at least things they deem risky, which is most likely things they don’t understand. Not everyone who asks this question is afraid of risk. Sometimes they are just responding to a preconceived notion of how dangerous motorcycles are. This deduction comes from horror stories heard from acquaintances and from sensational news reports. We all have prejudices based on indirect knowledge and assumptions. These people are simply reacting to what they think is the truth. Unfortunately, it is true that riding a motorcycle is dangerous. So, how do I respond? I guess I’m not a real biker…I have no tattoos. Really? Yep. This silly question usually comes from the mouths of people who make assumptions about what motorcycle riders “look like” and probably don’t personally know a motorcycle rider, or don’t know a motorcycle rider who does not have tattoos. The “biker types” get the attention of the general public because they make a lot of noise and go out of their way to look tough with their ink and leather “costumes”. These bikers get Mr and Ms. Public’s attention so that their perception is that motorcycle riders dress the way the loud riders dress. I challenge the ignorance of stereotypes by looking “normal”. Sure, I have my own costume, but it is that of a rider who embraces a motorcycling lifestyle as a sport, daily transportation, and a way to see faraway places. My response: “Shut the Hell Up.” Just Kidding. I might joke about having ink in places I can’t show in public and say it in a way that makes them question their assumptions of what some riders look like. And then I walk away. Yes, women ride their own motorcycles. This question was directed toward my wife when she, our then 10 year old daughter, and I walked into a restaurant on a family motorcycle trip several years ago with all of our riding gear in hand. Caroline hesitated for a moment in disbelief as she finally realized that the person assumed that women do not ride their own motorcycles, therefore the only explanation must be that we all somehow fit on one motorcycle or that a sidecar was the answer. A woman on her own bike never crossed their mind. 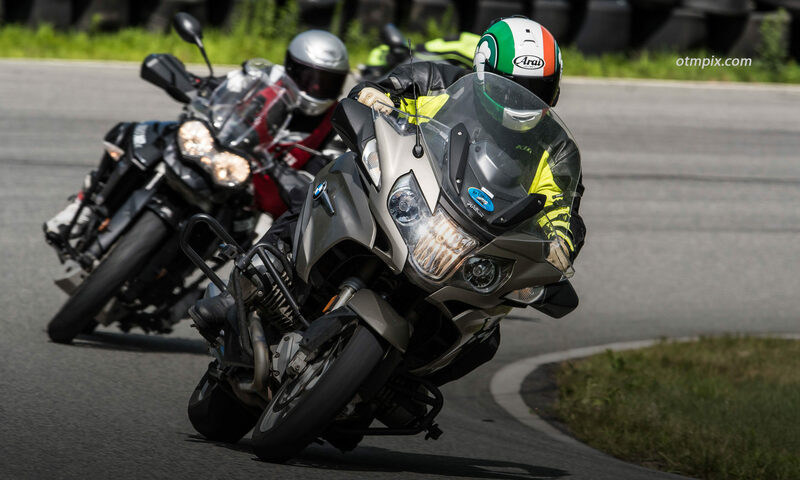 The Riding in the Zone Motorcyclist Training Program is kicking off it’s third season with the support of the American Motorcyclist Association and the Massachusetts Rider Education Program (MREP). I’m excited to see the RITZ street riding program grow. Students are signing up now for the summer. If you’re interested in participating, please visit the Personal Training Tours Page. One of this year’s students was able to receive the Paul B. Memorial Scholarship from the BMW/MOA Foundation for rider education. Here is an article about another rider who received a BMW/MOA scholarship to attend Lee Park’s Total Control course. I understand that the cost can be prohibitive for many, which is why I will be reaching out to other organizations and put together a list of available scholarships. If you know of such a program, please drop me a line. My goal is to make this program available to as many motorcycle riders as possible. I am scheduling training tour dates during the week when possible, but a weekend day is not out of the question. Ken teaching an MSF course. Personal Training Tours are designed for one or two riders, which allows individualized training. However, group days can be arranged. Last season, we conducted a two-day tour with the Women’s Motorcyclist Foundation Road to the Cures Program. If your group of friends or a club wants to talk about a training day (or weekend), Give me a shout. Also, read the Personal Instruction web page to learn all about the Program. If you have any questions, Contact Me. My daughter, Jeannine recently started a conversation about the plight of women riders that inspired me to write this post. Women riders are a significant part of motorcycling’s future, but the motorcycle industry doesn’t seem to recognize this. With relatively few young males entering the 2 wheel world, bike manufacturers would be wise to wake up to the fact that it is worth offering greater selection, as well as more R&D and marketing resources for women riders. No, I’m not a female motorcyclist, but I am the husband and father of two accomplished female riders and I consider myself as strong an advocate of women riders as they come. Jeannine has been on two wheels since she could reach the passenger footpegs and was twisting her own throttle at age 8. Jeannine is now a control rider for Tony’s Track Days and has worked in the motorcycle industry. My wife, Caroline learned to ride after we were married and eventually became a certified MSF instructor and track day rider. A very young Jeannine rides shotgun on Caroline’s first bike. There are a couple of topics that came from this conversation that got me thinking. One was the often-heard complaint of an inadequate selection of riding gear. The other more compelling topic was the plight of being in the constant shadow of male riders. First, let’s talk about the riding gear problem. What Do You Mean I Can’t Get the Same Boots as my Husband? Jeannine rocks her men’s Macna Night Eye riding gear. Caroline wears a men’s jacket and pant combo, because they offered the best features. Even though selection is getting better, serious women motorcyclists must often settle for riding gear that is a compromise between style and protection. And, from what I hear, women riders aren’t wanting to wear gear that says “isn’t she cute in that pink outfit?”. Because a lot of women-specific gear has become a bit over the top in the styling department, many female riders choose to wear gear designed for men, which often doesn’t fit right and may even lack the best venting or adjustability. I can’t help but think that the gear that manufacturers offer to women are designed by men who are hunting for what women really want. To be fair, it could very well be that women don’t quite know what they want in riding gear, since their identity as motorcyclists is constantly evolving. Style is one thing, but a more significant issue is protection. Most women-specific riding gear provides inferior protection compared to gear that is routinely offered to men. Riding jackets and pants may not have the best armor or the most rugged materials. One of many examples is the selection of Sidi race boots. The most advanced women’s boot offered by Sidi is the Vertigo Lei, which in comparison is middle-of-the-road Sidi boot for men. If you want a boot with all the protection and features of the top of the line boot, you’re plum outta luck, girls. Here is a great post from GearChic about how to design motorcycle gear for women without being sexist. The second point Jeannine made in our conversation was quite intriguing… and that was the fact that women riders cannot often detach from their significant other who also rides. In the beginning of Jeannine’s riding career, she learned from me and rode exclusively with me (and often with her Mom). Only recently has she realized that being in my shadow has held her back from gaining a deep level of confidence and being fully immersed in motorcycling. Her trip to Alaska with MotoQuest afforded her the opportunity to ride with a group of male riders, none of whom were her Dad. This made her more dependent on her skills, knowing that I wasn’t there to take care of her (not that she needs me to take care of her anymore… although she will always be my little girl). 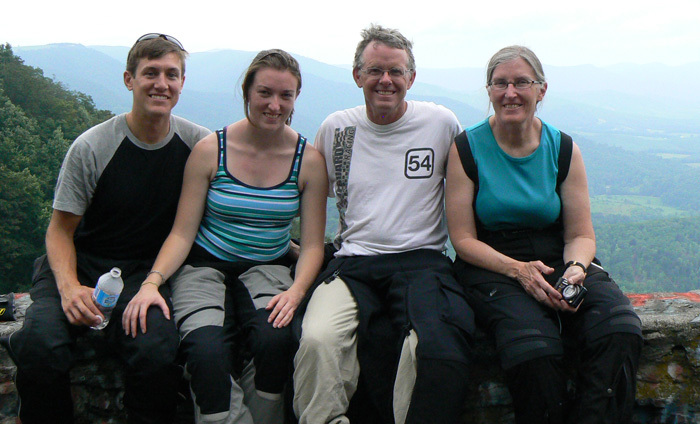 With this freedom, Jeannine experienced riding at a deeper level of self-competence. I’m Going Riding with The Boys, Have Dinner Ready, Okay? It wouldn’t be inconceivable to think of a man saying that to his wife (or girlfirend), but can you imagine a woman saying that to her husband? Since most women riders probably have a male partner that is a motorcyclist himself, it is not bloody likely that the woman would think she could ride with another male rider who wasn’t her boyfriend or husband. What does this mean? It means that a serious woman rider can’t ride with other male riders, lest she be scrutinized as a sort of loose harlot who would rather ride with someone else rather than her husband. To avoid this situation, she must either ride with other female riders (it’s easy to imagine her saying, “I’m going riding with Sheila”), or be stuck riding with her significant other (S.O.). Imagine the conflict that a female rider would have to deal with who is more accomplished than her S.O? I can tell you that the male ego doesn’t tolerate being told that he is not as good as he thinks he is. This is a problem for anyone in this situation, whether male or female, but it rarely goes well when coming from a woman. Just ask Jeannine who is a track day control rider to mostly male riders. Time to step aside so your shadow casts away from your partner. So, what’s the secret to the harmonious motorcycling relationship? First, if your wife or girlfriend wants to ride without you, ask her why and then listen carefully. If she mentions feeling stifled, encourage her to arrange a ride without you. She shouldn’t need your permission, but she needs your support. If she says something that suggests that she doesn’t like how you ride, then listen carefully without your hairy ego getting in the way. Be a man of the 21st century and believe that it is possible that a woman can know more and ride better than a male. The fact is that men weren’t born as proficient riders. If you accept that you don’t know all there is to know, then you’ll be a better S.O. I can see where this topic could upset some riding couples’ status quo, but I think it’s worth a discussion, with the hope that both partners can reach their full potential as motorcycle riders. There is a lot more to consider around this subject, including the pressure women have from overbearing male partners, the intimidation that goes along with branching out, and the evolution of a self-identity that is more than being the second half of a riding couple. Stay tuned for more. In the meantime, give me your thoughts. And check out this interesting post from Ride Apart about marketing to women.